Self healing materials have recently started flourishing their applications in various fields. Self healing materials have the ability to heal itself by means of chemical reaction of the material from which it is made with the surrounding environment. Even though self healing materials are not that easy to understand, but that’s what can be said in a nutshell. Recently engineers have started implementing self healing materials in manufacturing building where the materials will self heal any cracks and damage. This material mentioned here is super effective and can heal itslef in about a second. Scientists at the Chemical Engineering department, University of Michigan, Ann Arbor have innovated a rapid, puncture initiated healing material, that can heal any punctures made on spacecrafts or any such devices instantly by the method of oxygen mediated polymerization. These materials utilize thio-elene polymerization stimulated by environment borne reactions. 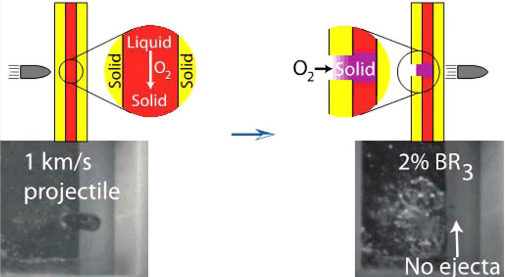 The experiment was done by sandwiching thiolene trialkylborane resin material layer is sandwiched between solid polymer panels with high velocity projectiles. When the reactive liquid flows through the entrance hole, it comes in proximity to atmospheric oxygen which initiates polymerization and the liquid converts to solid plug. This is not the first self healing material but obviously the first material to accomplish the liquid to solid transaction within a second.